BACKGROUND/AIM Proinflammatory cytokines are key factors in the pathogenesis of Crohn's disease (CD). Activation of nuclear factor kappa B (NFκB), which is involved in their gene transcription, is increased in the intestinal mucosa of CD patients. As butyrate enemas may be beneficial in treating colonic inflammation, we investigated if butyrate promotes this effect by acting on proinflammatory cytokine expression. METHODS Intestinal biopsy specimens, isolated lamina propria cells (LPMC), and peripheral blood mononuclear cells (PBMC) were cultured with or without butyrate for assessment of secretion of tumour necrosis factor (TNF) and mRNA levels. NFκB p65 activation was determined by immunofluorescence and gene reporter experiments. Levels of NFκB inhibitory protein (IκBα) were analysed by western blotting. 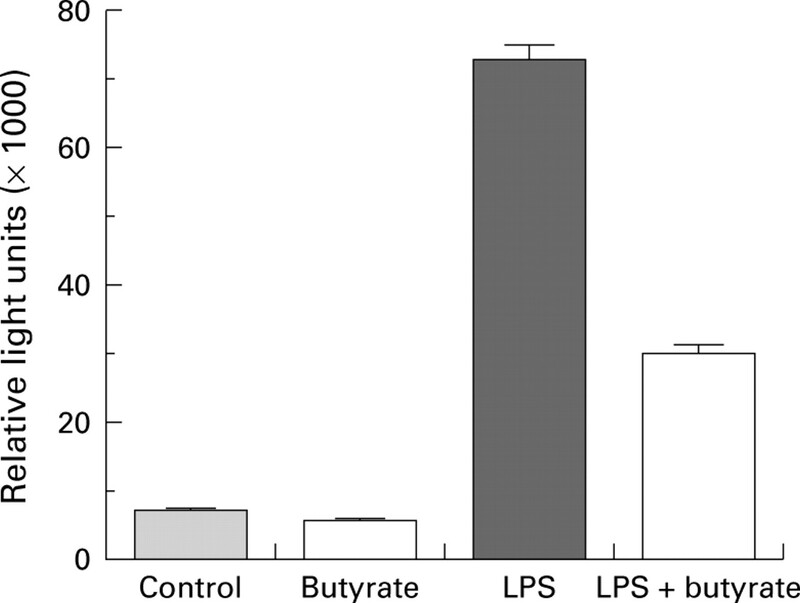 The in vivo efficacy of butyrate was assessed in rats with trinitrobenzene sulphonic acid (TNBS) induced colitis. RESULTS Butyrate decreased TNF production and proinflammatory cytokine mRNA expression by intestinal biopsies and LPMC from CD patients. Butyrate abolished lipopolysaccharide (LPS) induced expression of cytokines by PBMC and transmigration of NFκB from the cytoplasm to the nucleus. LPS induced NFκB transcriptional activity was decreased by butyrate while IκBα levels were stable. Butyrate treatment also improved TNBS induced colitis. CONCLUSIONS Butyrate decreases proinflammatory cytokine expression via inhibition of NFκB activation and IκBα degradation. These anti-inflammatory properties provide a rationale for assessing butyrate in the treatment of CD. 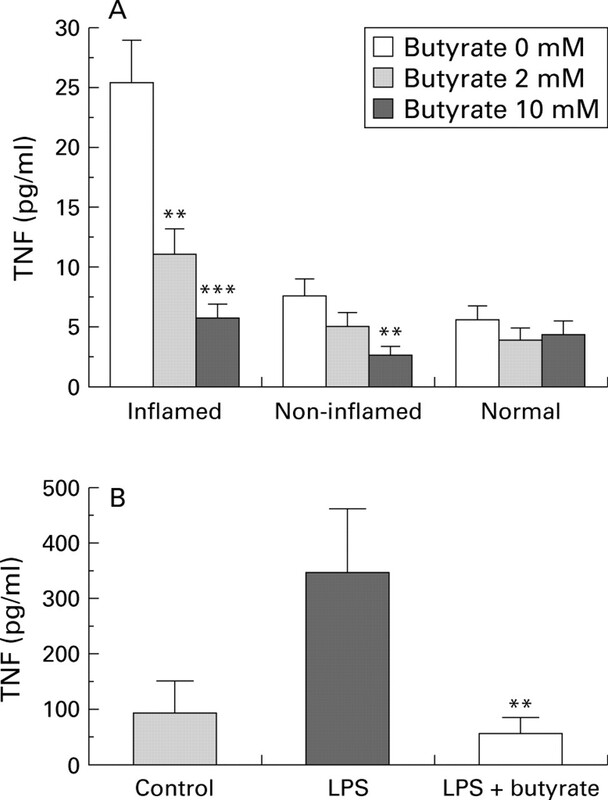 In this study we investigated if butyrate reduces inflammation in CD through an inhibitory effect on proinflammatory cytokine expression and the transcription factor NFκB. Seventeen patients with CD (nine males, eight females; aged 18–75 years) and six healthy controls (three males, three females; aged 27–65 years) were prospectively included. At the time of the study, four patients were receiving steroids, six 5-aminosalicyclic acid, and one azathioprine. Six CD patients and all controls were not receiving any medication. All patients underwent endoscopy for medical reasons. Colonic biopsy specimens were obtained from inflamed and/or non-inflamed mucosa of patients with active or inactive CD. Mucosal biopsies were taken from control patients free of organic intestinal disease who underwent sigmoidoscopy or colonoscopy as part of a gastroenterological work up. All patients gave informed consent to take part in the study. Biopsies were cultured for 24 hours with or without butyrate (2 and 10 mM; Sigma, Saint Quentin Fallavier, France) in RPMI 1640 supplemented with 10% fetal calf serum, l-glutamine, penicillin, streptomycin, and gentamycin. All tissue culture products were from Life Technologies (Cergy Pontoise, France). Supernatants and biopsies were recovered separately, snap frozen in liquid nitrogen, and stored at −80°C for TNF assay or RNA isolation, respectively. LPMC were isolated using the method of Bull and Bookman.25 Biopsies were incubated in fetal calf serum free medium supplemented with 1 mM EGTA and 0.1% bovine serum albumin at 37°C for 30 minutes, and then with 100 U/ml of type VIII collagenase (Sigma) for another 30 minutes. After Ficoll density gradient, LPMC were cultured with or without 2 mM butyrate at 37°C for 24 hours. Supernatants and cells were recovered separately for cytokine assay and RNA isolation, respectively. PBMC were isolated from heparinised blood by Ficoll density gradient. Cells (5×106) were cultured with or without 2.5 μg/ml of LPS (Salmonella typhosa, Sigma) for 24 hours. The medium was replaced by medium alone or supplemented with either LPS (2.5 μg/ml), butyrate (2 mM), or both, and incubated for another 20 hours. Trichostatin A (TSA 0.5 μM), a histone deacetylase inhibitor (kindly provided by Professor M Yoshida, Tokyo, Japan) was tested under the same conditions. Supernatants and cells were recovered for cytokine assay and RNA isolation, respectively. In parallel experiments, PBMC or LPMC were cultured on coverglasses under the same conditions as described above. Cells were fixed for five minutes in −20°C methanol, air dried, and permeabilised for five minutes with phosphate buffered saline/0.3% Triton X-100. After saturation of non-specific binding sites with normal goat serum at 10 μg/ml in phosphate buffered saline, cells were incubated with anti-NFκB p65 (Rel A) polyclonal antibody (Santa Cruz Biotechnology, California, USA) or normal rabbit IgG for one hour at room temperature followed by incubation with a fluorescein isothiocyanate conjugated goat antirabbit antibody (Caltag Laboratories) for one hour. After washes, the slides were mounted for fluorescence microscopy. Biologically active total TNF-α/β was measured using the WEHI 164 clone 13 cell killing assay.26 Concentrations of total TNF are expressed as pg/ml. Total RNA from biopsies, LPMC, and PBMC was isolated using TRIzol Reagent (Life Technologies). cDNA was generated on 1 μg of total RNA in a reaction volume of 20 μl, using M-MLV reverse transcriptase (RT; Life Technologies). PCR was performed in the linear range of amplification (determined for each primer pair-cDNA combination). Standard PCR reactions were performed with 1 μl of the cDNA solution, 50 μM of each primer solution, 10 mM of each dNTP, 25 mM MgCl2, 10X Goldstar DNA polymerase reaction buffer, and 0.5 units of Goldstar DNA polymerase (Eurogentec, Seraing, Belgium). Each PCR cycle consisted of one minute at 92°C, one minute at 58°C, and one minute at 72°C. The following sense/antisense primers (Genosys, Pampisford, UK) were designed to amplify cDNA fragments that span at least one intron of the corresponding gene: TNF-α: 5′-AAGCC TGTAGCCCATGTTGT-3′ and 5′-CAGAT AGATGGGCTCATACC-3′; TNF-β: 5′-AAA CCTGCTGCTCACCTCATT-3′ and 5′-TGG ATACACCATCTTCTGGG-3′; IL-1β: 5′-TG CCCGTCTTCCTGGGAGGG-3′ and 5′-GG CTGGGGATTGGCCCTGAA-3′; IL-6: 5′-TA GCCGCCCCACACAGACAG-3′ and 5′-GG CTGGCATTTGTGGTTGGG-3′; β-actin: 5′-GGCATCGTGATGGACTCCG-3′ and 5′GC TGGAAGGTGGACAGCGA-3′. The plasmid 3XMHC-luc (a generous gift from Drs J Westwick and D A Brenner, University of North Carolina, Chapel Hill, USA) contained three copies of NFκB responsive elements from the MHC class I locus, placed upstream of the luciferase gene. Human monocytic THP-1 cells were transiently transfected as previously described27 and cultured for four hours alone or with 2.5 μg/ml LPS, 2 mM butyrate, or both. Luciferase activity was determined using a luminometer (Monolight 2010 Luminometer, Ann Arbor, Michigan, USA). THP-1 cells were stimulated for various periods of time with 2.5 μg/ml LPS in the presence or absence of 2 mM butyrate. Cells were pelleted, washed, and homogenised in lysis buffer (10 mM Hepes, pH 7.9, 150 mM NaCl, 1 mM EDTA, 0.6% NP-40, 0.5 mM PMSF, 1 μg/ml leupeptin, 1 μg/ml aprotinin, 10 μg/ml soybean trypsin inhibitor, 1 μg/ml pepstatin) on ice. Homogenates were sonicated and centrifuged at 5000 rpm to remove cellular debris. Protein concentrations were determined by DC protein assay (Bio-Rad, Hercules, California, USA). Samples (15 μg of total protein) were separated on a denaturing 12% polyacrylamide gel and transferred to a nitrocellulose membrane. IκBα protein was detected by chemiluminescence using a rabbit polyclonal antibody according to the manufacturer's instructions (New England Biolabs, Hitchin, UK). Colitis was induced in Wistar rats (n=20) by infusing 30 mg of TNBS/40% ethanol into the distal colon. From the third day after TNBS instillation, rats were randomised to one of two groups (n=10 each) and treated daily with isotonic saline or 100 mM butyrate enemas for two weeks. Colonic damage was scored morphologically and histologically using semiquantitative methods, as described previously.28 29 Principles of laboratory animal care and guidelines according to the declaration of Helsinki were followed. The colon was removed from TNBS treated rats, and paraffin sections were prepared and stained with haematoxylin and eosin. Immunostaining for colon paraffin sections was performed using a monoclonal antibody to the p65 subunit specific to the activated form of NFκB, according to the manufacturer's instructions (Boehringer Mannheim). TNF concentrations are expressed as mean (SEM) and were compared using the Student's t test (normal distribution) or Wilcoxon's test for paired samples. One way ANOVA was used to analyse the dose effect of butyrate on TNF concentrations. Biopsies from inflamed mucosa produced higher levels of TNF (as well as IL-1β and IL-6, data not shown) than those from non-inflamed or normal mucosa (fig 1A). In the presence of butyrate, TNF levels decreased dose dependently in both inflamed (p=0.0001) and non-inflamed (p=0.0153) biopsies. With 10 mM butyrate, TNF levels (as well as IL-6 and, less consistently, IL-1β) returned to control values. Similarly, 2 mM butyrate strongly inhibited LPS induced TNF production by PBMC in both CD patients and control subjects (fig 1B). No significant toxicity or apoptosis (Annexin v/propidium iodide cytometric analysis) was noted in PBMC treated with butyrate concentrations up to 6 mM (data not shown). Effect of butyrate on tumour necrosis factor (TNF). Colonic biopsies (A) from inflamed (n=14) or non-inflamed (n=15) mucosa of patients with Crohn's disease or from normal (n=6) mucosa of healthy controls were cultured for 24 hours with or without 2 or 10 mM butyrate. **p<0.01,***p<0.001 v 0 mM. (B) Peripheral blood mononuclear cells (PBMC) (n=7) were cultured for 24 hours alone or in the presence of 2.5 μg/ml lipopolysaccharide (LPS) followed by 20 hours under the same conditions with or without 2 mM butyrate. Supernatant concentrations of total TNF were assessed by WEHI cell bioassay, and results are expressed as mean (SEM). **p<0.01 v LPS. RT-PCR analysis revealed increased mRNA levels for TNF-β, IL-1β, and IL-6 in biopsies from inflamed areas and isolated LPMC (fig 2A). As reported by Isaacs and colleagues,30 TNF-α was scarcely or not detected in ethidium bromide stained gels. Butyrate reduced mRNA cytokine expression dose dependently in both biopsies and isolated LPMC (fig 2A). 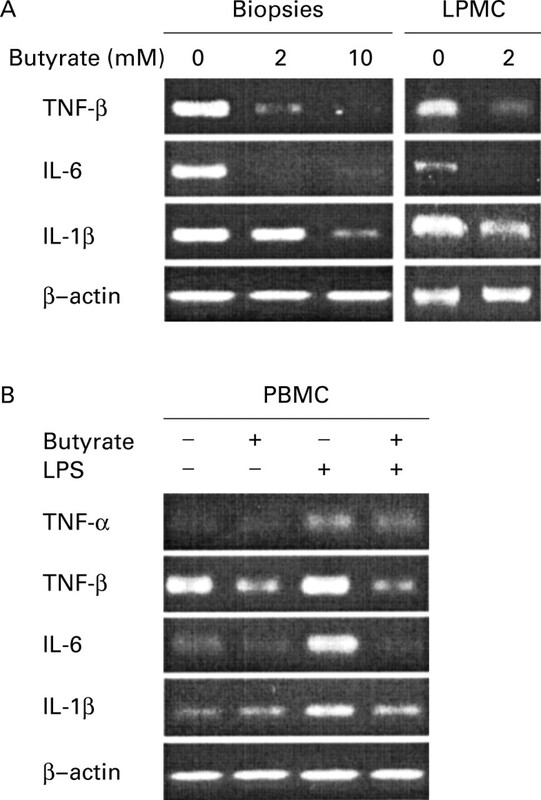 Subsequent studies of the effect of butyrate on the LPS induced inflammatory response of PBMC showed that LPS stimulated TNF-α, TNF-β, IL-1β, and IL-6 mRNA expression (fig2B). Butyrate treatment resulted in reduction or inhibition of LPS stimulated expression of cytokine mRNAs. Effect of butyrate on proinflammatory cytokine mRNA. Biopsies and isolated lamina propria mononuclear cells (LPMC) (A) from inflamed mucosa of patients with Crohn's disease were cultured for 24 hours with or without 2 or 10 mM butyrate. Peripheral blood mononuclear cells (PBMC) (B) were cultured for 24 hours alone or in the presence of 2.5 μg/ml lipopolysaccharide (LPS) and then for another 20 hour period under the same conditions with or without 2 mM butyrate. RNA was extracted and RT-PCR was performed using primers designed for interleukin (IL)-1β, IL-6, tumour necrosis factor (TNF)-β, TNF-α, and control β-actin. In unstimulated cells, NFκB p65 was detected mainly in the cytoplasm (fig 3A). Stimulation of PBMC with LPS induced translocation of NFκB p65 from the cytoplasm to the nucleus (fig 3B), which was inhibited by butyrate (fig 3C). Similar results were obtained when immunofluorescence was performed on LPMC and frozen sections of cultured CD biopsies (data not shown). In THP-1 monocytes transfected with an NFκB/luciferase reporter plasmid, butyrate inhibited LPS induced luciferase activity and thus NFκB driven reporter gene transcription (fig 4). Effect of butyrate on nuclear translocation of nuclear factor kappa B (NFκB). Peripheral blood mononuclear cells (PBMC) (A) unstimulated, (B) lipopolysaccharide (LPS) stimulated, or (C) LPS stimulated and treated with 2 mM butyrate. The intracellular location of NFκB p65 (RelA) was determined by immunofluorescence using an anti-NFκB p65 polyclonal antibody. Magnification, ×400. Effect of butyrate on nuclear factor kappa B (NFκB) transcriptional activity. THP-1 cells were transiently transfected with the NFκB reporter plasmid 3XMHC-luc and cultured alone or in the presence of 2.5 μg/ml lipopolysaccharide (LPS), with or without 2 mM butyrate for four hours. Luciferase activity was then determined. Data are mean (SEM) of four experiments. As butyrate inhibited LPS induced NFκB activation, we wished to determine if this effect was mediated by inhibition of IκBα degradation, the NFκB inhibitory protein. Western blot analysis of total THP-1 cell protein extracts showed a decrease in IκBα levels only four hours after stimulation with LPS (fig 5). In the presence of butyrate, this effect was abolished and IκB levels were stable throughout the period of stimulation with LPS. Effect of butyrate on inhibitor protein kappa Bα (IκBα) expression. THP-1 cells were stimulated for various periods of time with 2.5 μg/ml lipopolysaccharide (LPS), in the presence or absence of 2 mM butyrate. Cell lysates were subjected to western blot analysis of IκBα. Similar results were obtained with PBMC and LPMC of CD patients (data not shown). Butyrate may affect gene expression by inhibiting histone deacetylase.31 32 Thus the effect of butyrate on TNF production by LPS stimulated PBMC was compared with that of the histone deacetylase inhibitor TSA. Contrary to the inhibitory effect observed with butyrate, TSA treatment of unstimulated or LPS stimulated PBMC increased TNF production (fig 6). Comparison of the effects of butyrate and trichostatin A (TSA) on production of tumour necrosis factor (TNF). Peripheral blood mononuclear cells were cultured for 24 hours alone or in the presence of 2.5 μg/ml lipopolysaccharide (LPS) followed by 20 hours under the same conditions with or without 2 mM butyrate or 0.5 μM/ml of the histone deacetylase inhibitor TSA. Supernatant concentrations of total TNF were assessed by WEHI cell bioassay, and the results are expressed as mean (SEM) of three experiments. As reported by our group33 and others,19butyrate enemas in rats with experimental colitis induced by rectal instillation of TNBS decreased inflammation (MPO activity, data not shown) and stimulated mucosal repair (fig 7A, B). In organ cultures, colonic segments from TNBS inflamed rats produced high levels of TNF which were decreased by butyrate treatment (data not shown). We then explored the efficacy of butyrate enemas by monitoring the effect on NFκB activation in the colonic mucosa of rats with TNBS induced colitis. A monoclonal antibody specific for the activated form of NFκB p65 was used for immunofluorescence staining of colonic sections. Numerous infiltrates of intensely labelled immune cells were detected in rats receiving saline enemas (fig 7C), and activated NFκB p65 was also detected in epithelial cells (fig 7C). Conversely, a marked reduction in both infiltrating cells and activated NFκB p65 staining was observed in rats receiving butyrate enemas (fig7D). Effects of butyrate treatment on established colitis. Haematoxylin and eosin stained (A, B) paraffin sections of colon of rats with trinitrobenzene sulphonic acid (TNBS) induced colitis receiving isotonic saline (A) or 100 mM butyrate (B) enemas for two weeks. Magnification, ×200. 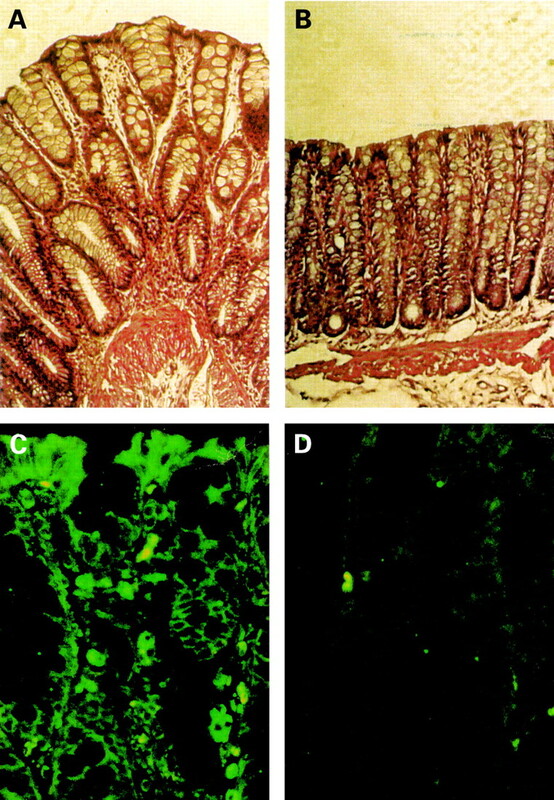 Immunofluorescence staining (C, D) of paraffin sections of colon of rats with TNBS induced colitis receiving isotonic saline (C) or 100 mM butyrate (D) with a monoclonal antibody specific to the activated form of nuclear factor kappa B. Magnification, ×300. We have demonstrated for the first time that butyrate inhibits inflammatory responses in CD by inhibition of NFκB activation in immune cells. High levels of circulating and mucosal proinflammatory cytokines are a characteristic feature of CD.1 2 We confirmed that intestinal biopsies as well as isolated LPMC obtained from inflamed mucosa of CD patients secrete significantly more IL-1β, IL-6, and TNF than normal controls.7 34 35 Our main finding was that butyrate had a dose dependent effect in decreasing TNF secretion in both inflamed and non-inflamed tissues. Interestingly, with 10 mM butyrate, TNF levels returned to control values. Similar results were observed for IL-6 and, although less consistently, for IL-1β (data not shown). Although intestinal epithelial cells can secrete proinflammatory cytokines, we focussed on immune cells which are the main effectors of the inflammatory response in CD. We then determined that butyrate decreased proinflammatory cytokine production by downregulating mRNA expression in both intestinal biopsies and LPMC. To elucidate the mechanism of action of butyrate, we designed experiments mimicking the inflammatory states of biopsies or isolated LPMC from CD patients. Circulating bacterial LPS may contribute to monocyte activation in patients with CD36 and it is well established that monocytes secrete a host of cytokines in response to LPS, including TNF, IL-1β, and IL-6. As expected, LPS stimulation resulted in increased TNF secretion by PBMC, an effect abolished by butyrate. Similarly, butyrate decreased mRNA expression of proinflammatory cytokines by PBMC in response to LPS. The decrease in cytokine mRNA expression prompted us to examine the effect of butyrate on the key transcription factor NFκB, which is implicated in the regulation of a variety of genes during immune and inflammatory responses,17 including those encoding TNF, IL-1, and IL-6. Moreover, it has been shown that NFκB activation is increased in the colonic mucosa of CD patients. The active form of NFκB is present in the cytoplasm of resting cells bound to inhibitory protein of the IκB family. Activation of NFκB by inflammatory cytokines or LPS requires IκB degradation thus allowing NFκB to translocate to the nucleus. In PBMC and LPMC of CD patients, butyrate inhibited nuclear translocation of NFκB, an effect associated with an increase in IκB levels observed in western blot experiments. We further investigated the effect of butyrate on NFκB transcriptional activity using monocytic THP-1 cells transfected with an NFκB/luciferase reporter plasmid. In this system, luciferase gene expression was exclusively controlled by NFκB, and it was also determined that butyrate inhibited NFκB driven luciferase gene transcription. Moreover, in parallel experiments, western blots of THP-1 cell extracts showed that this effect was mediated through stabilisation of IkBα levels, probably by inhibiting its degradation. Taken together, these results provide convincing evidence that butyrate downregulates inflammatory responses through inhibition of NFκB. The mitogen activated protein kinase family is involved in activation of IκB kinases (IKK-α and -β), which in turn can activate NFκB by phosphorylating IκB.37 It would be interesting to determine if butyrate interferes with the LPS induced IκB phosphorylation pathway. Butyrate may also regulate gene expression through inhibition of histone deacetylase.31 32 However, this seems unlikely as TSA, a histone deacetylase inhibitor, did not block TNF production or affect NFκB translocation to the nucleus. It has recently been reported that butyrate also inhibits NFκB activation38 and increases IκBβ levels38 39 in vitro in intestinal epithelial cell lines. At present, treatment of CD is limited to aminosalicylates, corticosteroids, and immunosuppressants. The anti-inflammatory properties of butyrate described in the present study offer an interesting alternative approach for the treatment of CD. Indeed, downregulation of TNF is of major therapeutic interest in CD, as demonstrated by the marked improvement following administration of monoclonal antibodies to TNF in CD patients resistant to steroids.11 Furthermore, Schreiber et al recently reported that secretion of TNF-α may be predictive of relapses in CD.42 In contrast, the importance of TNF-β in IBD has also been emphasised recently in experimental murine models of colitis.43 Another interesting aspect of TNF-α and TNF-β modulation is that these cytokines not only have an inflammatory role but are also involved in Th1 immune responses.44 Neutralisation of TNF-α by antibody therapy caused inhibition of Th1 responses in CD patients.45 The capacity of butyrate to downregulate TNF-α/-β expression indicates that it may also regulate Th1 immune responses in CD. Interestingly, butyrate is reported to induce anergy in Th1 cells.23Finally, we have found that butyrate also stimulates anti-inflammatory/type 2 cytokines (for example, IL-10) and downregulates type 1 cytokines (for example, interferon γ) (unpublished data). As it now seems well established that a Th1 driven immune process is involved in CD whereas a Th2-like process is involved in ulcerative colitis, butyrate therapy may be indicated more in CD than in ulcerative colitis. In conclusion, the benefit of butyrate has already been reported in diseases such as haemoglobinopathies or urea cycle disorders, giving few or no side effects.46 47 In both disorders, butyrate was administered intravenously. In contrast, in ulcerative colitis, butyrate enemas have not always provided convincing results. Its effect on immune cells by this method may not be optimal. Further studies should also be conducted to determine how butyrate can best be administered in IBD, particularly in CD. (1994) Cytokines (immunoinflammatory hormones) and their natural regulation in inflammatory bowel disease (Crohn's disease and ulcerative colitis): a review. Dig Dis 12:290–304. (1995) Increased mucosal TNF-α levels and numbers of TNF-α producing cells are unique to Crohn's disease mucosal inflammation. Gastroenterology 106:A754. (1992) Tumour necrosis factor alpha in stool as a marker of intestinal inflammation. Lancet 339:89–91. (1991) Serum concentrations of tumour necrosis factor alpha in childhood chronic inflammatory bowel disease. Gut 32:913–917. (1994) Tumor necrosis factor alpha-producing cells in the intestinal mucosa of children with inflammatory bowel disease. Gastroenterology 106:1455–1466. (1998) Secretion imbalance between tumour necrosis factor and its inhibitor in inflammatory bowel disease. Gut 43:203–209. (1995) Differences in the intrinsic capacity of peripheral blood mononuclear cells to produce tumor necrosis factor alpha and beta in patients with inflammatory bowel disease and healthy controls. Scand J Gastroenterol 30:1095–1100. (1997) Mesalamine in the maintenance treatment of Crohn's disease: a meta-analysis adjusted for confounding variables. Gastroenterology 113:1465–1473. (1996) Cytokines in autoimmunity. Curr Opin Immunol 8:872–877. (1997) A short-term study of chimeric monoclonal antibody cA2 to tumor necrosis factor alpha for Crohn's disease. Crohn's Disease cA2 Study Group. N Engl J Med 337:1029–1035. (1997) Randomised controlled trial of CDP571 antibody to tumour necrosis factor-alpha in Crohn's disease. Lancet 349:521–524. (1994) Randomised double-blind comparison of chimeric monoclonal antibody to tumor necrosis factor alpha (cA2) versus placebo in rheumatoid arthritis. Lancet 344:1105–1110. (1998) Activation of nuclear factor kappa B inflammatory bowel disease. Gut 42:477–484. (1998) Nuclear factor kappa B is activated in macrophages and epithelial cells of inflamed intestinal mucosa. Gastroenterology 115:357–369. (1996) Local administration of antisense phosphorothioate oligonucleotides to the p65 subunit of NF-kappa B abrogates established experimental colitis in mice. Nat Med 2:998–1004. (1996) The NF-kappa B and I kappa B proteins: new discoveries and insights. Annu Rev Immunol 14:649–683. (1994) Effects of short chain fatty acids on gut morphology and function. Gut 35 (suppl 1) S35–S38. (1996) Butyrate enema therapy stimulates mucosal repair in experimental colitis in the rat. Gut 38:568–573. (1980) The colonic epithelium in ulcerative colitis: an energy-deficiency disease. Lancet 2:712–715. (1998) In vivo butyrate metabolism and colonic permeability in extensive ulcerative colitis. Gastroenterology 115:584–590. (1997) n-butyrate downregulates the stimulatory function of peripheral blood-derived antigen-presenting cells: a potential mechanism for modulating T-cell responses by short-chain fatty acids. Immunology 92:234–243. (1993) Th1 cell anergy and blockade in G1a phase of the cell cycle. J Immunol 151:1245–1254. (1996) Butyrate enhances major histocompatibility complex class I, HLA-DR and ICAM-1 antigen expression on differentiated human intestinal epithelial cells. Eur J Clin Invest 26:803–810. (1977) Isolation and functional characterization of human intestinal mucosal lymphoid cells. J Clin Invest 59:966–974. (1986) A highly sensitive cell line, WEHI 164 clone 13, for measuring cytotoxic factor/tumor necrosis factor from human monocytes. J Immunol Method 95:99–105. (1996) Integrin signaling to NF-kappa B in monocytic leukemia cells is blocked by activated oncogenes. Cancer Res 56:2302–2305. (1989) Hapten-induced model of chronic inflammation and ulceration in the rat colon. Gastroenterology 96:795–803. (1998) Elevated plasma leptin concentrations in early stages of experimental intestinal inflammation in rats. Gut 43:783–790. (1992) Cytokine messenger RNA profiles in inflammatory bowel disease mucosa detected by polymerase chain reaction amplification. Gastroenterology 103:1587–1595. (1994) Effect of butyrate on gene expression. in Short chain fatty acids. eds Binder HJ, Cummings J, Soergel KH (Kluwer Academic, Dordrecht), pp 135–147. (1997) Macrophage inflammatory protein-2: chromosomal regulation in rat small intestinal epithelial cells. Proc Natl Acad Sci USA 94:10279–10284. (1998) Short chain fatty acid propionate and the role of β-oxidation of butyrate in rat experimental colitis. Gastroenterology 114:A1118. (1996) Increased production of tumour necrosis factor-alpha, interleukin-1 beta, and interleukin-6 by morphologically normal intestinal biopsies from patients with Crohn's disease. Gut 39:684–689. (1993) Enhanced secretion of tumour necrosis factor-alpha, IL-6, and IL-1 beta by isolated lamina propria mononuclear cells from patients with ulcerative colitis and Crohn's disease. Clin Exp Immunol 94:174–181. (1993) Crohn's disease monocytes are primed for accentuated release of toxic oxygen metabolites. Gastroenterology 105:60–66. (1998) Signal transduction through NF-kappa B. Immunol Today 19:80–88. (1999) High-level expression of I kappa B-beta in the surface epithelium of the colon: in vitro evidence for an immunomodulatory role. J Leukoc Biol 66:1049–1056. (1999) Counter-regulatory effect of sodium butyrate on tumour necrosis factor-alpha (TNF-alpha)-induced complement C3 and factor B biosynthesis in human intestinal epithelial cells. Clin Exp Immunol 118:23–29. (1994) Inhibition of NF-κB by sodium salicylate and aspirin. Science 265:956–959. (1995) Immunosuppression by glucocorticoids: inhibition of NF-kappa B activity through induction of I kappa B synthesis. Science 270:286–290. (1999) Tumour necrosis factor α and interleukin-1β in relapse of Crohn's disease. Lancet 353:459–461. (1998) Both the lymphotoxin and tumor necrosis factor pathways are involved in experimental murine models of colitis. Gastroenterology 115:1464–1475. (1992) Tumor necrosis factor (TNF-alpha) and lymphotoxin (TNF-beta). Curr Opin Immunol 4:327–332. (1997) A role for TNF-alpha and mucosal T helper-1 cytokines in the pathogenesis of Crohn's disease. J Immunol 159:6276–6282. (1993) A short-term trial of butyrate to stimulate fetal-globin-gene expression in the beta-globin disorders. N Engl J Med 328:81–86. (1996) Long-term treatment of girls with ornithine transcarbamylase deficiency. N Engl J Med 335:855–859.